Century Motorsport have proved they have the winning combination at every round of the 2013 BARC Saxmax Championship this year with a 100% winning record with last year’s runner up, Guy Wenham. Championship newcomer Martin Poole endured a difficult start to his season when he joined the championship at round three at Oulton Park. Since then however, the Premeditate Design LTD supported driver has rarely been off the podium or the front row of the grid. Donington Park played host to the latest rounds of the 2013 BARC Saxmax Championship. Saturday’s qualifying session was yet another routine affair for Guy Wenham in the Supagard Saxo. Pole position for both of Sunday’s races ensured he would have the best chance of keeping his winning record in tact. 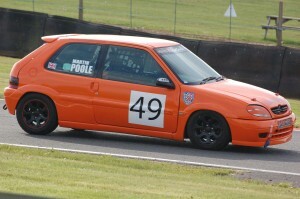 Martin Poole continued to shine as a newcomer to car racing. The Karting graduate once again qualifying along side team mate Wenham in second for race one and just behind in third for Sunday afternoon’s race two. Pleasant sunny conditions at the Leicestershire venue ensured the scene was set for two thrilling races. Off the line from pole position Guy Wenham lead the field into the first corner. Struggling at the start, teammate Martin Poole found himself down in fourth exiting the first corner. At the end of the opening lap, Wenham had now started to build a comfortable lead whilst Poole began mounting a challenge for third. By the end of the third lap, Poole had found a way past championship rival James Dorlin and next on his radar was George Streather in second. Out in front Guy Wenham was continuing to show a clean pair of heels until he suddenly appeared to loose control of the car and ended up in the barriers at the second part of the chicane. Luckily Wenham was unhurt in the incident which was later found to be caused by a broken steering rack. Now promoted to second, Martin Poole was more eager than ever to cease the opportunity and take his first victory. However when the chequered flag was raised as the leaders came out of the chicane for the final time, Poole just couldn’t reel in eventual winner George Streather and crossed the line in a superb second position. After some extensive repair work by the Century Motorsport team, Guy Wenham was able to take up his pole position starting slot for Sunday afternoon’s race two. Just behind him on the grid was teammate Martin Poole who was keen to continue his podium finishing run. A poor start for the Century pair left them down in third and fourth respectively. Wenham, who was now very keen to return to the top step of the podium quickly found a way past James Dorlin on the second lap and set about chasing down Streather who by now had built a slender lead. Martin Poole was next to fill Dorlin’s mirrors for the final podium place. Poole needed to find a creative way past as Dorlin was driving a very defensive race. Back at the head of the field, Guy Wenham and George Streather were now side by side for almost half a lap as they battled for the lead. Described by some as an eight-wheeled Saxo as the pair ran door to door, Wenham took the advantage coming up to Coppice and into the lead. An equally entertaining battle was now continuing for third place between James Dorlin and Martin Poole. Getting ahead briefly on the Exhibition Straight, Poole was forced wide at the Chicane as Dorlin held the inside line. Back out in front it was a return to the winner’s rostrum for Guy Wenham as he crossed the line to win and now equal the current record for the maximum number of race wins in a season, a record he is surely set to beat. Just behind him, Martin Poole was putting together a final attempt to get onto the podium. A superb move around the outside of rival Dorlin, allowed him to move into third position as they crossed the finish line and with it Martin’s second podium of the weekend.